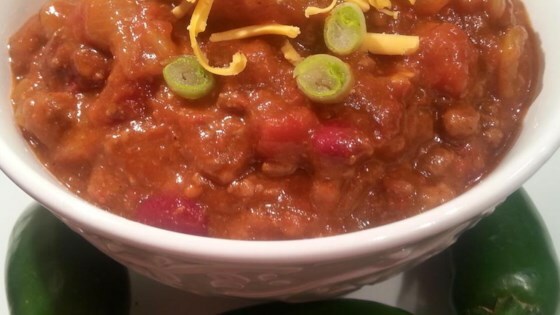 "Spicy beef, onion, and beer chili recipe I picked up while in Alabama. Many people have asked me for the recipe so I'm posting it here. Enjoy! Adjust the amount of jalapenos and other spicy things to suit your taste." Crumble the ground chuck into a skillet over medium heat. Cook, stirring occasionally until evenly browned. Drain grease. Transfer the beef to a large soup pot. Add onions, diced tomatoes, tomato sauce, beer and chili beans. Season with Worcestershire sauce, hot pepper sauce, chili powder, jalapenos, and red pepper flakes, if using. Cover the pot, and simmer over low heat for 2 hours. Turn off heat, and let cool, then refrigerate for two days. It gets much better with time. Heat and serve. I like a spicy chili but this was just too much for me. I followed the recipe exactly- except I used green chilis instead of jalopanoes. I have had much better chilis. It was just o.k. Please keep in mind that cooking beer for 2 hours as the recipe states winds up cooking away any alcohol from the beer. All that's left is the flavor. Awesome Chili. My department entered this chili in a chili cookoff and we took People's Choice. Thanks for the great recipe!